Off Label collects all the appointments with the dance research of Arearea Company, it promotes the young contemporary choreography and hosts dancers of international reputation in its venue, Lo Studio. Festival for a new dance, now in its eighth edition, is a welcoming space where to get close to contemporary. This year, the collaboration with Ente Regionale Teatrale of Friuli Venezia Giulia for projects dedicated to children will be strengthened. Teatroescuola, as part of Piccolipalchi_Paesaggi, offers a festival with 3 events dedicated to children dance and chooses Lo Studio as action space. 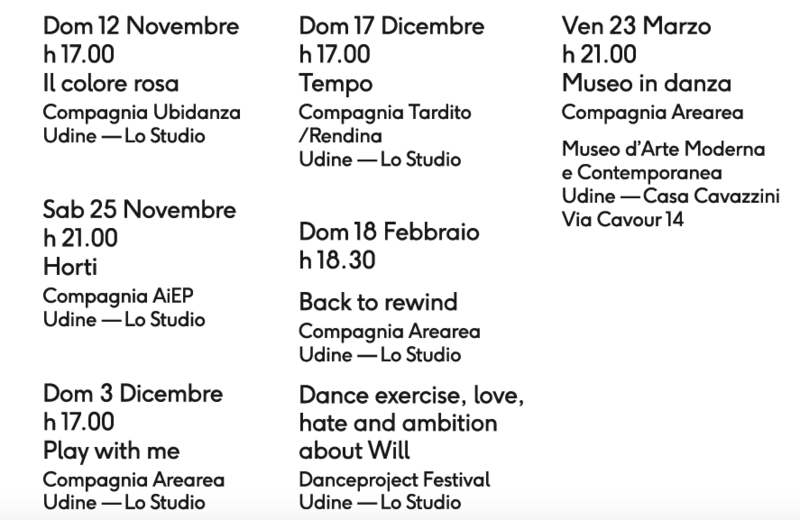 Lo Studio will host, for three Sunday afternoons, the following dance shows: “Il colore rosa” by Aline Nari, an ALDES production in collaboration with Ubidanza, “Play with me” by Marta Bevilacqua with Valentina Saggin and Alessandro Maione and, finally, the theatre-dance show dedicated to very little children “Tempo” by Compagnia Tardito/Rendina. Choreographer Ariella Vidach will come back to FVG region. Together with Claudio Prati, she signs the new production “Horti”: an original path where the audience has an active role, as well as a critic one, able to determine and modify the scene with its choices and presence. Arearea is scheduled in February with “Back to rewind” by Valentina Saggin, created and danced with Anna Savanelli. The research started from a question: What were we like as teens? We wanted to be trendy and alternative, we were thrilled to have new coming-of-age experiences, we were jealous of our secrets and impatient to discover love. The duo answers to the question with a dynamic and ironic choreography. Following, “Dance exercise, love, hate and ambition about Will,” a project of international artistic residency with Silvina Helena Grinberg e Daša Grgič.